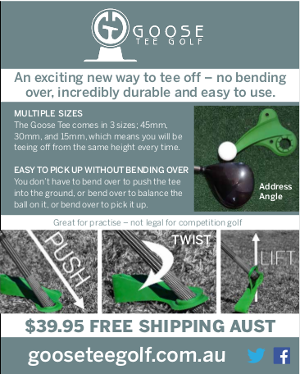 FOR those not ready for something mechanical to help them get their golf bag around the course a new offering from Concourse Golf could be ideal. IN a surprise move Nike has announced it is moving away from making golf clubs, balls and bags … leaving the likes of Rory McIlroy and Tiger Woods without ongoing equipment sponsors. Maybe he's just boasting, but Larry Canning tells all about a recent first date. LIME coloured golf gear seems to be all the rage of late and we must say for some reason it does look good on a lot of new stuff – including these push cart offerings from Bag Boy, the Quad XL and TwiSwivel II. NIKE reckon they’ve done a lot of good things with their new Method Origin putters, which will be available in Australia from the beginning of June 2016. THE new ultra-lightweight Bag Boy Lite Rider is a sporty golf bag good not only for lugging around your home course but great when you are on the road. FROM Callaway Golf comes the opportunity to win one of their slick looking XR 16 Drivers, the newly available clubs they reckon Boeing had a hand in designing. THE new Titleist DT TruSoft Golf Balls are the latest incarnation of the brand’s “red packet” range, offering an increasingly softer feeling ball that offers good distance, short game playability and at an affordable price. GOLFERS not currently interested in having mechanised assistance in getting their gear around the courses might find this range of must-have trusty and traditional push buggies perfect for their needs. MGI has introduced their new MGI Tri Series range of motorised buggies, the MGI Terrain Tri Brake and MGI Ryder Tri Compact. SEARCHING for a new set of golf irons? There’s such a plethora of brands and models out there it can be a daunting task.